When you select your mountain bike, you will look at many factors including gearing, brakes, quality of build, quality of components, and size. Size is especially important when it comes to your bike, as you need to find a fit that is big enough to maneuver over uneven terrain and compact enough to fit through tight spaces and store conveniently. 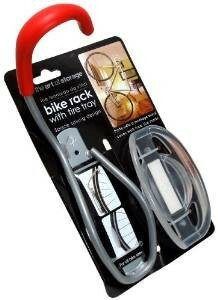 However if you are having trouble storing your bike, then you probably require a mountain bike rack to help you out. Mountain bike Racks allow you to conveniently, and neatly store your bike in your house, and are a must have for all biking enthusiasts. Additionaly, bike racks can work to safely transport your bike from one place to another. 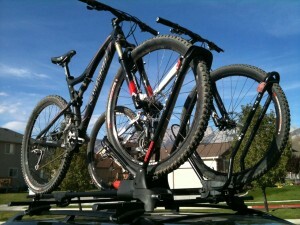 That is why we will be looking at the top mountain bike rack reviews below. The mountain bike racks given below are affordable, durable and of good quality, and will help you store or transport your bike without taking up needless space. The Swagman XTC is a 2-bike carrier that can be hitch mounted to your car when you want to transport your bike cross-country. This versatile rack has ratcheting arms that operate via a push button for simple adjustments, as well as grip arms that secure your bike as you drive. 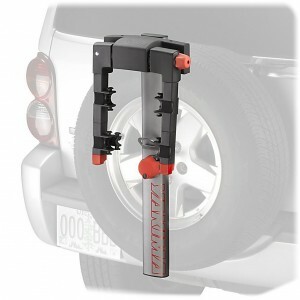 Additionally, the center arm of the hitch rack folds down so that you can access the rear of your vehicle. 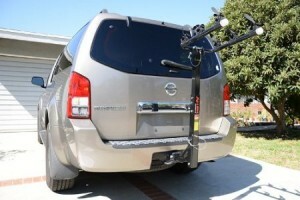 The hitch rack is also durable and simple to use, and prevents damage to either your car or bike during transportation. Discount Link – Buy Swagman Bike Hitch Rack on Amazon, Now! The compact and lightweight Topeak One Up is a sleek and functional bike hanger that comes in at 1.54 pounds. This single bike storage option is great for apartments and similar small spaces, as it provides a convenient wall-mounted solution for your mountain bike. Construction of the Topeak includes aluminum and plastic, as well as rubber pads that prevent wall damage. The bike hanger can support weights up to 35 pounds, and bike tires up to 2.35 inches in width. The rubber bar found on the hanger also ensures that the front wheel of your bike remains stationary, and the 2 extra hooks on the Topeak allow you to hang helmets, clothes, and other accessories. 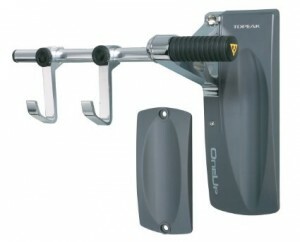 Discount Link – Buy Topeak Bike Hanger on Amazon, Now! The Thule 2 is an advanced hitch rack, which offers mountain bike enthusiasts a platform that emphasizes rack features, high performance, and convenient transportation. This hitch rack uses a reinforced tray to give you maximum strength and durability from below, and a Secure Hook with incorporated cable locks for secure transportation from on top. The rack has been designed to protect your bike and your vehicle, and makes the process of storing your bike and transporting it very simple. When you are not using the rack, a Hitch SwitchTM lever will fold up and store the platform. Discount Link – Buy Thule Bike Hitch Rack on Amazon, Now! 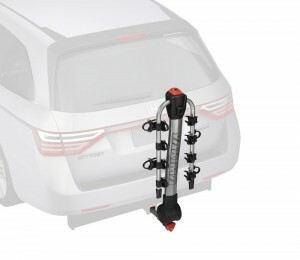 Yakima scores again with the RidgeBack 4-Bike Hitch rack, which allows you to carry up to 4 bikes on your car. This fully assembled rack can fit hitch receivers measuring 1.25 inches and 2 inches, and utilizes a SpeedKnob for quick installation on your vehicle and ZipStrips for securing your bike to the rack. You can also benefit from anti-sway cradles that individually protect your bikes, and an UpperHand lever that folds the rack flat for easy storage. Discount Link – Buy Yakima Hitch Rack on Amazon, Now! The FrontLoader is an innovative piece of biking equipment that will leave you and your friends in awe once you see it. This bike rack presents itself as aerodynamic and versatile in function, with a universal mounting system that can fit almost all crossbars (round, factory, square, and aerodynamic) for your convenience. The bike rack can accommodate 20 inch to 29 inch wheels, and has been designed to prevent contact between the bike frame and the vehicle roof. Discount Link – Buy Rooftop Bike Rack on Amazon, Now! The Over-The-Top trunk bike rack has been constructed to accommodate two bikes, and is made up of a high rise frame that safely carries your bike without bringing it into contact with the spoiler of your vehicle. The adjustable frame is supported by hatch anchors and connect hooks, whose job it is to secure your attachment to trunks, hatches, and roof racks. Additionally, the cradles of the bike have anti-sway properties which prevent your bike from moving around as you transport it. Discount Link – Buy Hollywood Bike Rack on Amazon, Now! 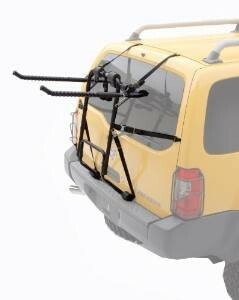 The Allen Sports Trunk Mount Rack is a two bike carrier that helps transport bikes on sedans, SUV’s, hatchbacks, and minivans. This custom designed bike rack is quick to set up and safe to transport your bike, as it is equipped with tie-downs and side straps for improved lateral stability and security. The fully assembled mount rack has a padded lower frame that prevents your bike from damaging your car, as well as carry arms that accommodate a variety of bike sizes and frame styles. What you have in the end is a safe, simple, and convenient way of transporting your bike cross country or around town. Discount Link – Buy Trunk Mount Rack on Amazon, Now! 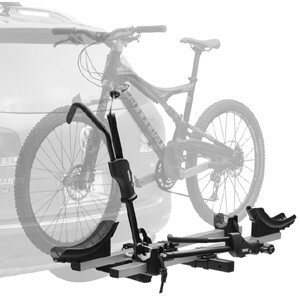 The Deluxe 3-Bike mount rack from Allen Sports is similar to the Deluxe-2 mount rack we talked above, except for the fact that it can fit up to 3 bikes on vehicles that have a 1.25 inch or 2 inch trailer hitch. This durable mount rack allows for the secure transportation of your bike, and eliminates the need for piling bikes in your trunk or stacking them on rooftop mounts. This easy to operate mount rack is constructed out of sturdy steel with black powder finish, and consists of tie downs that cradle each of your bikes in the 16-inch long carry arms. The mount rack is also easy to set up, and the carry arms can fold up and out of the way when they are not in use. Discount Link – Buy Hitch Mount Rack on Amazon, Now! 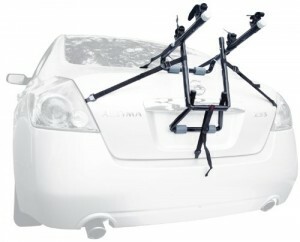 The Yakima Sparetime is an innovative bike rack that attaches to the mounting bolts in the spare tire of your car. 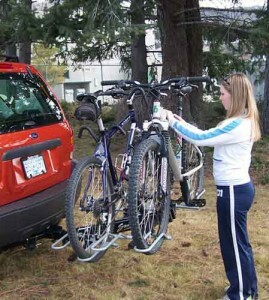 This rack can carry two bikes at a time, making it the perfect accessory to your Jeep or SUV. The rack boasts of a 60 inch locking cable and anti-sway cradles for secure transportation, which also works to prevent scratches and dents on your vehicle. The rack has been constructed using solid steel with a powder-coated finish, giving you peace of mind as you drive around town or cross country. Discount Link – Buy Yakima Bike Rack on Amazon, Now! The Delta Leonardo is an affordable single bike rack, which can be mounted to your wall via a wall stud as a way of storing your bike. This bike rack is fantastic for apartments and homes that have limited space as it takes up little room. The bike rack has a maximum load capacity of 40 pounds, and can accommodate mountain bikes with wheels of varying sizes. There is also an included Da Vinci wall tray that comes with the bike rack, which works to protect your wall from contact damage and keep it clean from any dirt that comes off the bike. The Delta Leonardo is therefore an elegant, lightweight and durable wall-mounted bike rack for convenient storage. Discount Link – Buy Delta Bicycle Rack on Amazon, Now! So if you are looking to store your bike at home or transport it to and fro, then the ten mountain bike racks that we have reviewed above is the way to go. These racks have been tried and tested time and again, and will definitely provide you with convenience, security, and durability.